BRIGANTINE, New Jersey -- A stormy winter chewed up New Jersey's beaches more than usual, requiring greater efforts to restore them before the summer crowds hit the sand. In some places, erosion and beach loss was greater this past winter than it was after Superstorm Sandy in 2012, while other places appeared to come through the winter relatively unscathed. 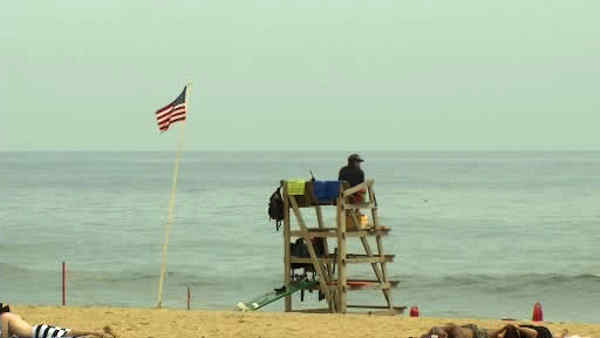 With Memorial Day crowds a week away from storming the coast, beachgoers will find the Jersey shore ready for visitors, even if some spots are narrower than they were last year. Jon Miller, a coastal expert with Stevens Institute of Technology in Hoboken, said two major storms did significant damage to the beaches: Hurricane Joaquin in October, which passed offshore but still churned up enough surf to cause erosion; and a winter storm the last week of January that carved 15-foot drop-offs into some beaches. "The two storms were markedly different in their characteristics, but both caused significant erosion, particularly on the beaches that had yet to be nourished after Sandy," Miller said. "When Joaquin stalled, it spared us a direct hit from a very large storm, which was a good thing, but as it sat offshore it pumped waves at us for the better part of a week," he said. "The cumulative result of all those waves was beach erosion that was actually worse than Sandy in some parts of the state. Since it occurred so early in the season, it also left many communities vulnerable, and some had to do emergency repairs to prepare for the next storm." Then a winter storm in late January caused even more erosion; it was shorter-lived, but more intense than Joaquin, Miller said. In February, there were smaller storms that would not normally have caused concern, but because they came after so much erosion had already taken place, some shore towns had to truck in tons of sand to replace what was lost. Miller said a lot of the sand that was lost to the storms is now sitting in sand bars offshore, but the bars are larger and further from the beaches than normal, so it might take longer to naturally return to the beach through wave action. The Associated Press surveyed beaches in all four of New Jersey's coastal counties for a snapshot of what the Jersey shore looks like at the start of the season. Beach widths are estimates based on visual inspections. MANASQUAN: Beach is about 300 feet wide after a recent replenishment. "Portable dunes," consisting of large sand piles the borough bulldozed up to the edge of its walkway to protect against winter storms, have been flattened out and smoothed onto the beach. SEA BRIGHT: Some noticeable sand loss in erosion-plagued northern half of beaches following last year's replenishment, but still has about 100 feet wide beaches in central beach where most visitors go. MONMOUTH BEACH: Workers have been trucking in tons of sand to make up for erosion; beaches about 100 feet wide. ALLENHURST: Serious erosion visible with up to half of the sand from last year's replenishment project gone from some parts of the beach. About a 60-foot-wide beach remains. ASBURY PARK: Has lost a noticeable amount of sand since last year, but still has about a 400-foot-wide beach. BELMAR: Held onto much of its sand from a recent replenishment, with a 600-foot-wide beach in most places; some erosion in narrower southern end. BAY HEAD: Was hit hard by the two main winter storms, which washed away a good portion of its beach and exposed a rock wall between the surf and the town's homes. Sand has been pushed back over the rock wall, and beaches have reappeared, though somewhat narrower than last year. MANTOLOKING: Beaches that had a 15-foot drop-off, forcing the town to close them off during the winter, have been repaired. Many appear somewhat narrower than last year. BRICK: A 10-foot drop-off has been filled in and erosion has been countered by additions of sand. Beaches are about the same width as last year. LAVALLETTE: A well-established dune system slops down to 150-foot-wide beaches; minimal erosion visible. ORTLEY BEACH (a section of Toms River): This is one of the most erosion-prone sections of the shore, where Toms River officials regularly truck tons of sand to replace what washes away. The truck deliveries have established a 50-foot-wide beach, about the same as last summer. SEASIDE PARK: Robust dune system helps keep sand in place; 100 feet of beach; minimal erosion visible. SHIP BOTTOM: Beach replenishment from last year held up well, with 300-foot-wide beaches and fresh new dune grass plantings. LONG BEACH TOWNSHIP: A massive dune occupies about two-thirds of the beach, with less than 100 feet of sand between the surf and the dune line. BEACH HAVEN: Replenishment project underway, with more than 400 feet of beach in newly widened sections, plus 250 feet wide dunes. SURF CITY: A recent replenishment project is coming undone in spots where serious erosion is visible; 50 to 75 feet of beaches in spots; others somewhat wider. ATLANTIC CITY: 1,000- to 1,500-foot-wide beaches in many spots (and they're free, unlike most other Jersey shore beaches). VENTNOR: Up to 1,000-foot-wide beaches. MARGATE: The town fighting hardest against a proposed statewide dune project has about 1,000 feet of beach, but worries dunes will take up a large percentage of it. LONGPORT: About 1,000-foot-wide beaches except in erosion-prone southern end nearest inlet, where beach tapers down to about 200 feet. OCEAN CITY: Erosion-prone north end has about 150-foot-wide beaches near where dredging operations are underway. Near the amusement rides where most day-trippers visit, beaches are about 350 feet wide. Replenishment is underway in south end, used mostly by locals, where nearly 2,000 feet of sand has been recently placed. WILDWOODS: One of the most popular Jersey shore vacation spots, particularly for the Philadelphia crowd, this region has the widest beaches in the state. In fact, some visitors complain of the long walk to the surf; its largest beaches are a half-mile wide, and the city seriously considered a proposal from a vendor to give beachgoers camel rides from the boardwalk to the surf before rejecting the idea. The three beaches that comprise the Wildwoods - Wildwood, North Wildwood and Wildwood Crest - also are free.